Up to this point, Katelyn Laderoute's senior swimming season hasn't been up to her high standards. The West Linn standout got off to a slow start when she took time off for college visits, and midway through the year, her training was set back when she battled illness. "It definitely hasn't been my best," Laderoute said. 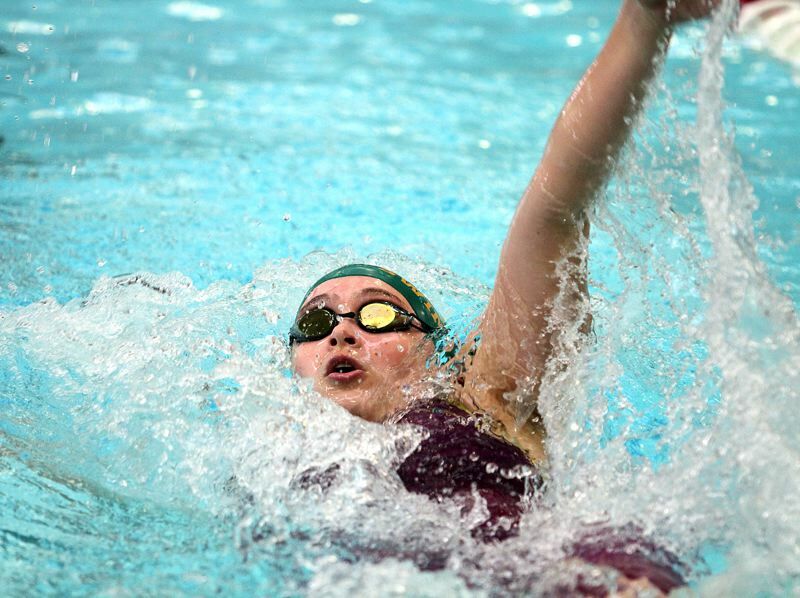 She has a chance to finish her high school career with a flourish, though, in the Class 6A championships Friday and Saturday at Tualatin Hills Aquatic Center. A year after winning her first individual title, in the 200-yard individual medley, and taking second in the 100 backstroke, she is hopeful for another strong performance. "I'm really excited for the meet," Laderoute said. "Anything can happen. I've been feeling really good in the water." Repeating her title in the 200 IM will be a tall order. With a stacked field, Laderoute enters as the No. 5 seed behind Sunset junior Tia Lindsay, Jesuit freshman Fay Marie Lustria, Mountainside sophomore Jessica Maeda and Lakeridge senior Ellie Jew. Lindsay beat Laderoute for the title in 2017 and Laderoute turned the tables last season, beating Lindsay by two seconds. The Arizona-bound Jew, who was third last season, has beaten Laderoute twice in Three Rivers League competition this season. It promises to be one of 6A's most compelling races. "I'm really excited," Laderoute said. "I raced Tia when I was a sophomore and junior. I know that she's super fast and I'm hoping that I'll be able to bring it to her level. I know there are other competitors out there, but I'm really excited to race all of them. I hope we can all kind of make each other better." Laderoute is seeded second in the 100 backstroke, an event in which she has finished seventh, fifth and second in the last three years. Her qualifying time of 55.70 is slightly behind Jesuit junior Isabella Wallace (55.62). "I'm hoping my backstroke will do really well. I'm excited for that race," Laderoute said. "The 100 back is just a race. You've really got to go for it. I've felt like I was holding back a little bit, and maybe at state I'll be able to go full-throttle and kind of go for it." West Linn coach Katie Wilson anticipates Laderoute rising to the occasion this weekend. "She usually always swims better at state than at district, so I'm not worried about it," Wilson said. Laderoute was out of the water for about two weeks when she took college trips early in the season, "so it was rough kind of getting back into it," she said. Dealing with illness was another challenge. "It wasn't the worst that I've been through, but it did slow me down," Laderoute said. "I just became a lot more tired, so everything seemed harder than it should've been. It was a little surprising to go through that. But I got through it. We're on taper now, so I can't complain." Laderoute has geared her training for the Speedo Spring Senior Sectionals next month in Federal Way, Washington, so she pushed through the district meet. "I'm tapering a little bit for state, but our main focus is Senior Sectionals," said Laderoute, who trains with Oregon City Swim Team. "I'm not rested completely." The state meet will mark the end of the line for the Laderoutes at West Linn. Laura Laderoute, now a junior on the team at the University of Houston, teamed with Katelyn on the state-champion 200 medley relay in 2016. Laura and Kate finished 2-3 in the 200 IM that year. Laura won the 200 IM as a sophomore and was part of four state titles in the 200 medley relay. "She definitely motivated me to keep going, and work really hard and not give up," Kate said. "She's really good at pushing through anything. She's a fighter. She's really inspired me a lot." Kate will continue her swimming career at Washington State next season. Before that, though, she would like to make one final mark. "It would be pretty nice to go out with a couple of titles," she said.